At HUMBLE Magazine we believe that every one has to have a voice and share their creativity and vision. Our magazine stands for ART and humble artists who create it. We are donation based publication, our aim is to share the work of talented artists with the world. HUMBLE Magazine is a donation based publication. Our preliminary aim is to share the work of talented artists with the world. We want to let our readers to set the price. HUMBLE Magazine is dedicated to artists around the world who share their vision and spread creativity. We believe that humble is more than just a word, it represents you as an artist. It shows the importance of the work that "creatives" produce. By being humble we let our work speak for itself. November 2018 HUMBLE issue is dedicated to Mental Health problems and with help from artists around the world we want to raise awareness. We believe that HUMBLE is more than just a word. In partnership with: British Fashion Council, Fashion Scout, X Terrace, Monique Lee Millinery, Fashion Rider, The Glass Pineapple. Delving into the archives for KENZO – La Collection Memento N°4, we were astounded once again at the volume of creatively and inspired printed pieces. For this collection we have decided to put the spotlight on some of the house’s most vivid and diverse prints and graphics. Swedish sports fashion brand Björn Borg drop their new collaboration – an underwear capsule created by Charles Jeffrey LOVERBOY. Charles Jeffrey releases his first underwear collaboration, a limited edition collection of men’s printed underwear, with Björn Borg…. Approaching Lacoste as a wellspring of iconography, the Autumn Winter 2019 collection revisits the bygone elegance of sport and its relevance in contemporary society. Movement of the body and movement on the body are at the forefront of research and development into shape and fabrication – unlocking pragmatic solutions for dressing that surpass their apparent simplicity. Step into the Daydream Vivier, where the dreams of women become a reality through the imagination of Creative Direc- tor Gherardo Felloni. The Daydream Vivier takes you on a daring trip through the desires, passions and the most foolish dreams of women…. AW19 is the brand’s ﬁnal collection shown with the support of Fashion East, and the collection brings a new mode of toughness to Knowles’ manifestation of femininity, moving away from SS19’s swimwear fantasies into a more brutal winter reality. "Softness is power — we don't need to dress like men," asserts Yuhan Wang who is presenting her second collection on the Fashion East platform. Wang's delicate designs are fashioned in silk satins, in lace, velvet and tulle to ripple and flounce around the female form. The ASAI woman has swum oceans, endured chaotic war zones and now wants to take root. It’s not her home. She has none as yet. But Englishness from afar appeals. The spice has dissipated to make way for wools that have lived …. The Halloween outfits to get us fashionably recognised! A simple white sheet thrown over us use to be the best Halloween costume going. I mean.. You didn’t have to worry about your makeup or the fact if you made any bad mistakes, then no one would of known who you were. Can we bring this costume back?! Social Media has now got us on the hype of who can dress the best. Halloween has been rated as one of the best holidays out of the year. Any excuse to dress up, watch endless amounts of horror movies and eat your body weight in sugary snacks.. Right?! As years of gone on and the power of social media is taking over some of our decisions, it has also gotten us to push our creative sides and inspire us. INLU: Cork becomes fashionable on Kickstarter! Anarchism? Or search for identity. Anarchism is the idea of search for identity that manifests itself in many different forms. The only way for the anarchist to discover his identity is to experience and evolve his individuality within the rest of society. Looking for liberation and knowledge of self, looking for the journey. Many anarchists consequently mark their own odyssey by the artwork that reflects their own struggle for self which is why anarchy and art are undeniably intertwined. Brooke Axtell first shared her abuse story on a global stage at the 2015 Grammy Awards when she collaborated with singer Katy Perry and Barack Obama to address domestic violence. 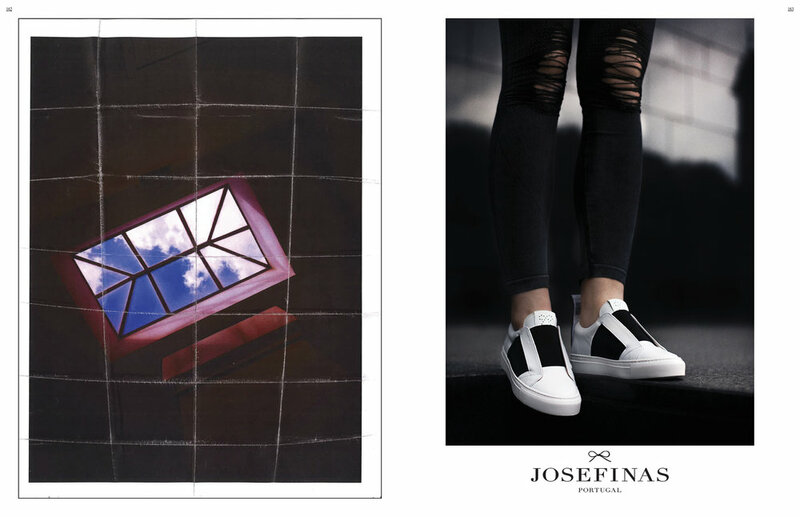 Now, the activist joins footwear brand Josefinas to fight domestic abuse through a collection of solidarity sneakers: for each pair sold, a woman survivor will receive life changing services like safety planning, counseling and mentoring through Brooke’s program She is Rising. Natalya Nova has been an artist that is the definition of creativity. She has a niche that sets her from everyone else by using her subconscious to create her one of a kind pieces of work. I got the privilege to interview Natalya and talk her about what keeps her influences in life and how she stays positive. What will the independent fashion- conscious woman be wearing this Autumn? Think strong animal print and leather (not together – unless of course you want to). With the Trump circus never ending and the #metoo movement making headlines all over the world it’s no surprise current affairs are making their way onto our clothes. Lets get Floral! Some good vibes for summertime. It’s the season of two thing – florals and weddings. The most popular month to get married is August, and since the 1970s, there seems to be a shift towards having summer weddings opposed to winter weddings. Thanks to Kendall Jenner for letting ‘Free the nip’ something we can all be comfortable in doing. I don’t know about you, but I know as soon as I step through my front door after work the first thing I want to do is take off my bra and get in my sweats. This collection questions the existence (or lack-of) of the boundary between black and white - right and wrong. Inspired by idols from Ancient Egyptology, this monochromatic collection presents the frequently discussed topic in a new minimal light. 5 Tips on how to wear cargo pants this season! Some trends are easy to master; the pastels, the mixed prints and even the white boot. But other trends can be tricky to get around.. The army influenced trend that brought us the cargo pants, has been an unexpected fashion item making a comeback this season. Animal Print is really DEAD? Lets Talk about "Gender" what is His ‘n’ hers? There was a time when if a man walked into the women’s department and vice versa you were either lost or just wanting to buy the easiest item possible for a loved one with the least amount of fuss. Could street style make you famous? “oh, wow I love your coat where did you get it from! ?” this was me walking up to stranger on the street after her blue and grey check coat caught my eye. For the first time, Primark has dropped their first designer collaboration and we are as excited as you are. Creative fashion god Henry Holland has been known for his playful and quirky collections. Imagine being able to get your hands on a £3 bag..